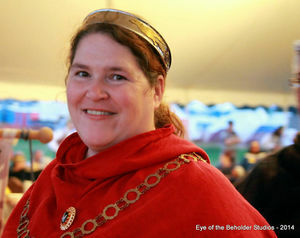 Baroness Kay Leigh Mac Whyte, OL, OP at Pennsic War XLII. Photo courtesy of Baroness Cateline la Broderesse. Sable, three quill pens in pile argent and a bordure rayonny gyronny Or and gules. 1 Kay Leigh Mac Whyte, aka Kayleigh McWhyte, aka Vanna della Bianca or Cellach Mac Faoitigh, aka "Baroness Dude"
Kay Leigh Mac Whyte, aka Kayleigh McWhyte, aka Vanna della Bianca or Cellach Mac Faoitigh, aka "Baroness Dude"
I began my journey through the SCA in 1984, when I was still very young, as an annual visitor to the Browns Road Renaissance Fair Demo in Ostgardr/An Dubhaigeainn. Each year, I would make a beeline for the hay bales to watch the fencers and fighters, and occasionally stop by the nice people under the big yellow pavillion labeled "Society for Creative Anachronism". Years passed, and I continued as a fringe player, attending a demo held at one of my colleges, Long Island University C.W. Post campus. 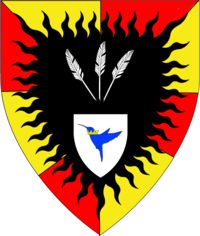 Following graduation and a move to western PA (Stormsport area, Æthelmearc), just a couple of hours north of this thing some local friends called "Pennsic", I eventually found my way back to the Barony of An Dubhaigeainn, back to that same exact demo on Memorial Day weekend of 1998. After speaking with the Baronial Chatelaine, I joined the SCA and jumped in with both feet, learning archery at my first event as a member of the Society for Creative Anachronism on June 24, 1998. Although I spent many years on the western border of An Dubhaigeainn, my travels often took me to most of the central and northern parts of the Southern Region, as well as frequently to Dragonship Haven, and Barony Beyond the Mountain, mostly for archery events at first. Eventually I found out who to speak to about working on scrolls for the Kingdom (Duchess Katherine was the Tyger Clerk of the Signet at the time), and also around the same time, I introduced a longtime friend from college (Ryan McWhyte) to the SCA. Laurel advisor to Vicerene Lada Monguligin (Calligraphy & Illumination). On September 16, 2016, my formal Laurel/Pelican relationship with Lada had to end upon the occasion of her investiture, so she may be in fealty only to the Crown and her Populace. By her request, she remains as a member of my extended Laurel/Pelican family tree, and I currently hold her "In Case of Peerage" letter, as she continues to strive for her own excellence in the Arts and Service. Lady Magdalena the Migrant, aka Magdalena Lantfarerin, aka "Ungrateful Child" (who is anything but ungrateful) (calligraphy and illumination) - student relationship formalized in October 2016, apprenticed at Mudthaw in Settmour Swamp on March 24, 2018. I have one formal student. Lady Raffaella Mascolo (Illumination) - Moved to Atenveldt, July 2014, then Midrealm (2016), and now back again to the East (2017). Raffaela is a protege of my husband, Master Ryan Mac Whyte, OP. Lada Monguligin (Calligraphy & Illumination, Service) - Released from formal apprentice/protege to serve as Vicerene of Ostgardr, September 16, 2016. Retained as family and as her Laurel/Pelican advisor upon her request. I am frequently found traveling within a 4 hour radius of Barony Beyond the Mountain, and will be available for occasional informal lessons along my travels as scheduling permits. After my last term as Tyger Clerk of the Signet ended in January 2015, I took a break from teaching until May to explore the world and raid- er, visit our friends in Æthelmearc (and hope to do so again someday), as a member of their College of Scribes too. I am primarily a teacher of calligraphy and illumination, having worked in many styles of C&I from Roman era to later period document style scrolls (including work in cadels). I am also knowledgeable in how to create a document style scroll, and had access until the end of my last term in office as Tyger Clerk of the Signet to the Seals of the Kingdom of the East, for use on armigerous (AoA, GoA, PoA), Cypher, Augmentation, King's Order of Excellence, Letters of Marque, and Tyger of the East scrolls done as documents. Please refer to the EK Wiki page about the Seals of the Kingdom of the East for more information on the seals themselves, who to send inquiries to, and more cool information on how seal impressions are made as an *optional* feature of scrolls made here in the East Kingdom. Although I do not expect further recognition, I prefer not to know in advance (surprises are appreciated). Please notify my husband, Ryan, for POC, who will in turn notify my households and dependents. Titles: As noted above, I really don't expect further recognition. I'd love to be called into court and someday receive a scroll under my alternate name, Vanna della Bianca, and my preferred gender identity is female in persona and out. I will not correct you if you call me Lady by accident, because that is still one of my titles, and was and is both an honor and joy for me to hold. If you call me by my full OP list of titles including current job/officer titles, however, I am going to think I stepped into something deep and need a ladder after digging myself out of a self-made pit. Note: Former 8m.com sites are now defunct. Images from these sites are unfortunately only available in thumbnail size upon request, but mostly live on in the Photobucket website listed above.